Global factory business activity expanded in August for the first time since May 2008 in a broad-based revival, witnessed especially in the United States and Japan, according to the global PMI index, produced by JP Morgan. The index rose to a 26-month high of 53.1 in August. The general picture is positive, and manufacturing output generally held up better again in August, although only a few countries managed to actually show an expansionary headline reading. 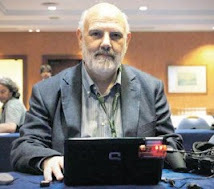 To be clear, when reading the individual countries it is important to understand that the headline index is made up of a series of sub indexes - like current output, sales, future orders and employment, and so the indicator is not equivalent to the actual industrial output reading later published by national statiistics offices. 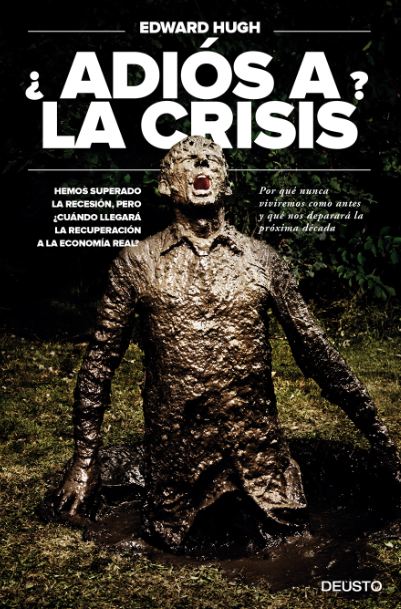 Indeed, since current output is only one of the sub indexes, the headline index can show deteriorating conditions even while current output is growing. The global manufacturing sector continued to gain traction in August. 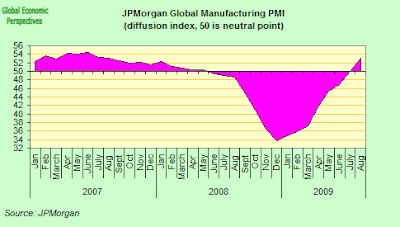 At 53.1, up from 50.0 in July, the JPMorgan Global Manufacturing PMI posted it highest reading for twenty six months and rose above the neutral 50.0 mark for the first time since May 2008. Production increased for the third month running in August and at the fastest pace for forty months. The expansion was broadbased, with gains especially marked in the US (growth at a near four-year high), Japan (three-and-a-half year high), and emerging Asian economies. The rate of expansion in China hit a 22-month peak, but in India eased back slightly to show the weakest reading in the current period of recovery. European economies tended to lag behind the rest of the economies surveyed, even though output seems to have risen in the Eurozone for the first time since May 2008. Within the Eurozone, the 'big-two' of France and Germany did better than most. There was notable continued weakness in Italy and Ireland, while Spain reported a drop in output following an increase in July. In the East of Europe, Hungarian manufacturing suffered a significant setback in August. Euro zone manufacturing activity shrank less than previously thought in August but there were strong differences between countries with contraction accelerating in Spain and Italy, according to the manufacturing PMI survey. 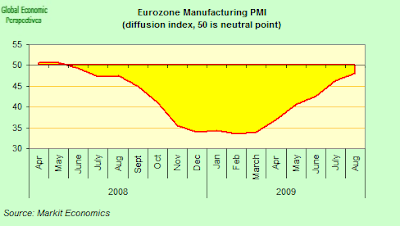 The Markit Eurozone Manufacturing Purchasing Managers Index for August jumped to 48.2 in August from 46.3 in July, above economists' forecasts and revised up from the 47.9 flash reading, but still below the 50.0 mark that divides growth from contraction. Current monthly output increased for the first time in fifteen months, with the rate of expansion above that signaled by the earlier flash estimate. France and Germany have rebounded noticeably in recent months and recorded the fastest rates of increase during August. Italy, Spain and Ireland were the only nations to report lower levels of output. Italy was by far the weakest performer overall and the only nation to report a steeper contraction of production than in July. Germany's industrial sector came close to returning to growth in August on a jump in output and new orders. 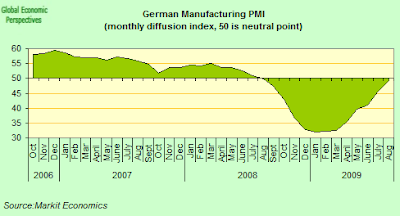 The Markit purchasing managers' index (PMI) of activity in the German manufacturing sector rose for a seventh month running, hitting 49.2 and closing the gap with the 50.0 threshold separating growth from contraction. 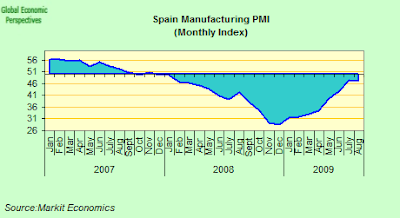 Spain's manufacturing sector continued to shrink in August at roughly the same pace as in July. 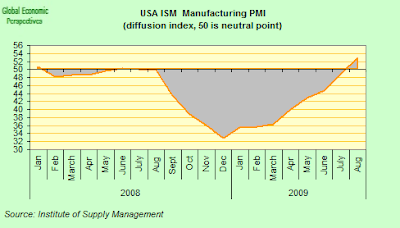 The Market Purchasing Managers' Index nudged lower to 47.2 from 47.3 in July, while manufacturing output again declined below the 50 mark after peeking just above that level last month for the first time since January, 2008. Italian manufacturing activity fell for the 18th straight month in August, with the first acceleration in the pace of contraction since last March. casting significant doubt over prospects for economic recovery in the country. 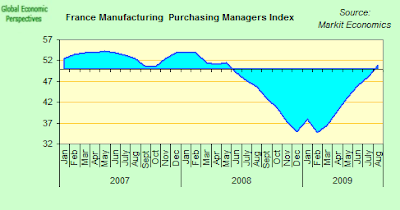 The Markit/ADACI Purchasing Managers Index fell to 44.2 from 45.4 in July. Italian manufacturers shed jobs for the 19th month running in August, the PMI showed, and although the relevant sub-index was the highest since October last year, "the rate of employment reduction remained considerable", Markit said. Input costs fell for the tenth month in a row, but at the weakest rate in the current sequence of declines, while factory gate prices dropped for an eleventh straight month as manufacturers offered discounts to vie for market share. 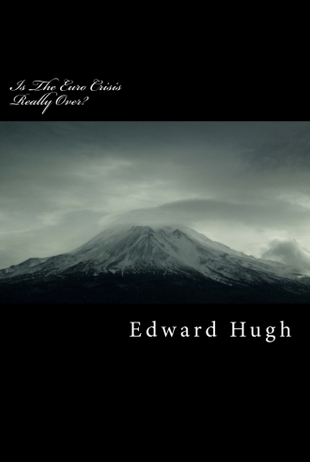 Italy has not previously posted two consecutive years of falling gross domestic product in its post-war history, but it looks ever more likely that this time the string of minuses might run to three. Activity in France's factories picked up for the first time in 15 months in August helped by a jump in new orders. 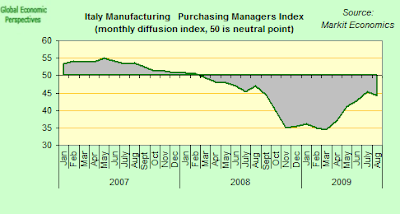 The Markit/CDAF final manufacturing purchasing managers' index rose to 50.8 from a final reading of 48.1 in July. It was the first time since May 2008 the index had broken through 50. Irish manufacturing posted a further decline in output as new orders fell at sharper pace in August. Output continued to fall, albeit at a reduced pace - production fell for eighteenth straight month. The decline in new orders was steeper than in the preceding month and jobs were again cut sharply. The seasonally adjusted NCB Purchasing Managers’ Index registered 44.0 in August, only slightly higher than July’s reading of 43.7, and indicative of another marked deterioration in business conditions at Irish manufacturers. Although August’s fall in production was the slowest in a year, it remained marked as new orders continued to decrease. 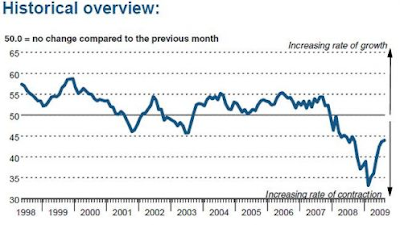 Production at Irish manufacturing firms has now declined in each of the past eighteen months. 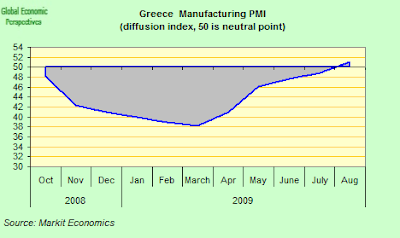 Greece’s manufacturing industry continued to strengthen in August, returning to very silght expansion after eleven months of continuous deterioration. The seasonally adjusted Markit Greece Manufacturing climbed to 51.1, signalling a slight improvement in operating conditions. The UK manufacturing PMI fell back in August despite gains in output and new orders. At 49.7, the seasonally adjusted CIPS/Markit UK Manufacturing Purchasing Managers’ Index (PMI) fell from a downwardly revised figure of 50.2 in July (previously reported as 50.8). Swedens manufacturing sectors slipped back a bit in August, although it did continue to expand, for the third successive month. 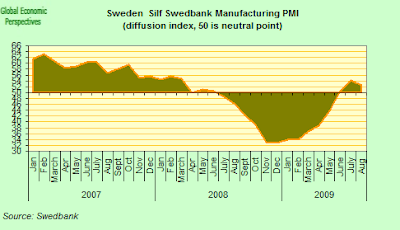 Sweden's seasonally adjusted purchasing managers' index fell to 52.4 points for the manufacturing sector in August from 54.3 points in the previous month, according to the Silf and Swedbank report. August represented the third consecutive month in the expansion zone for the index. The decline in August was the first fall from the preceeding month since December last year. Russia’s manufacturing industry contracted last month at the slowest pace in 11 months as new business and output grew simultaneously for the first time since September, according to the VTB Capital survey. 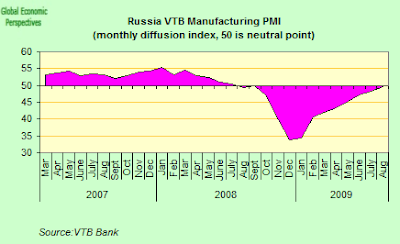 VTB’s Purchasing Managers’ Index advanced to 49.6 in August from 48.4 in the previous month. Manufacturing in Poland and the Czech Republic crept nearer to the brink of break-even in August. 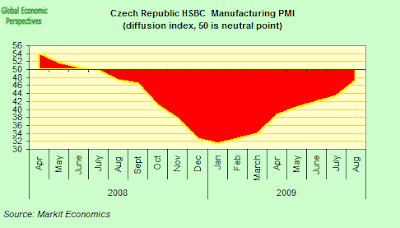 In the Czech Republic, PMI rose to 47.1 from 43.5 in July. In both Poland the Czech Republic, the industrial component of PMI, the backbone of the export-heavy region, cleared the 50 point hurdle for the first time since last year, rising to 51.8 and 51.5 respectively. Business confidence in Poland's industrial sector was better than expected in August, as industrial output rose, reversing a fourteen-month downward trend, and the Polish manufacturing PMI rose to 48.2 in August from 46.5 in July. 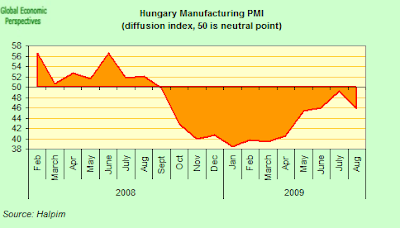 The improvement in Hungary's manufacturing PMI ground to a halt in August, following a rise for four consecutive months. The purchasing manager index dropped by 3.4 points to 45.8 points in August, according to today's report published by the Hungarian Association of Logistics, Purchasing and Inventory Management (HALPIM). This is not good news for Germany, since a lot of Hungarian activity is upstream work for the German manufacturing sector. 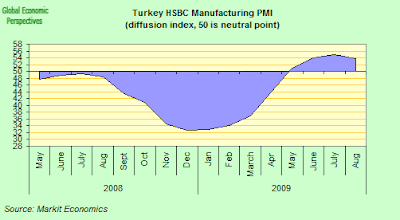 The HSBC Purchasing Managers' Index (PMI) for Turkey eased to 53.7 in August from July's 54.0, which was the highest level since September 2006. Despite the slight easing the PMI survey signalled a further strengthening of the Turkish manufacturing sector in August. The speed of growth in the industry fell only marginally compared to July’s record level, continuing the largely unchanged rate of expansion recorded over the last three months. Strong domestic demand fuelled a sustained rise in incoming new business received by Turkish manufacturers. Improved economic conditions were reported to be behind maintained sales growth, with new order levels rising for a fourth successive month. New export orders, however, seem to have increased only marginally, showing little improvement on levels experienced in July. Output increased within Turkish manufacturing companies during August, reflecting the higher order levels received. The rise in output slowed modestly on July’s survey record, in line with marginally weaker growth in new orders. Increased production capacity was sufficient for order fulfilment, demonstrated through the sustained fall in backlogs of work posted in August. However, stocks of finished goods reduced markedly in the month, as manufacturers depleted stocks wherever possible to meet order obligations. Purchasing activity increased in August, also in response to higher output. Despite this, suppliers continued to improve lead times, although at only a marginal rate. Manufacturers also signalled continued reductions in stocks of purchases, with inventory used in higher production. Employment levels rose for the third consecutive month, with the rate of growth accelerating over July data, as panellists indicated higher labour requirements to cope with increased orders and production. Japanese manufacturing activity in August reached the highest level in almost three years, a survey showed on Monday, as increased signs of the economy's recovery helped boost new orders at home and abroad. 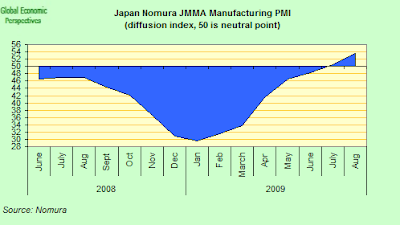 The Nomura/JMMA Japan Manufacturing Purchasing Managers Index (PMI) rose to a seasonally adjusted 53.6 in August, the highest level since November 2006, from 50.4 in July. The index remained above the 50 threshold that separates contraction from expansion for the second month in a row. 'The index's improvement suggests that the rebound in manufacturing is gaining momentum,' said Minoru Nogimori, an economist at Nomura Securities. The output component of the PMI index gained for the seventh straight month to 58.7 from 54.7 in July, staying above the key threshold for three months in a row and marking the highest reading since February 2006. The index for new export orders rose to a seasonally adjusted 53.2 in August from 52.7 in July, also the seventh month of improvement on stronger demand from China. The degree of the rise, however, narrowed to 0.5 point from 1.5 points in July. 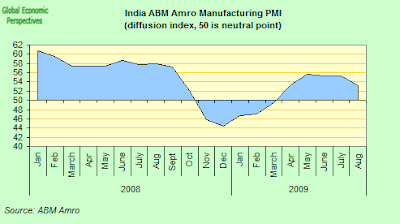 India's manufacturing activity continued to expand in August, but the pace of growth was the slowest in five months. Indian manufacturing activity expanded at its slowest pace in five months in August as companies struggled to raise selling prices despite higher costs, a survey showed on Tuesday. 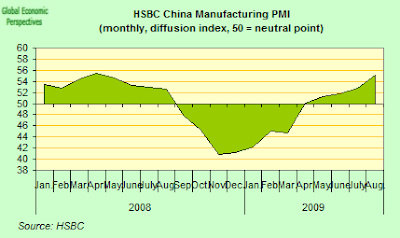 The HSBC Markit Purchasing Managers’ Index (PMI), based on a survey of 500 companies, fell to a five-month low of 53.2 in August from July’s revised reading of 55.4. The index has been above 50, which separates expansion from contraction, for five months. Before that, it shrank for the five months through March, hitting a trough of 44.4 in December. The new orders index fell to 56.2, also its lowest in four months, from 60 in July. China’s manufacturing sector expanded for the sixth straight month in August to a 16-month high, according to the official purchasing managers’ index, an indication that the economy continued to see strong recovery. The official Purchasing Managers’ Index rose to a seasonally adjusted 54 from 53.3 in July, the Federation of Logistics and Purchasing said in an e-mailed statement today in Beijing. A PMI released by HSBC Holdings Plc also climbed, showing an overall increase to 55.1 from 52.8 in July and a jump in export orders. The official output index rose to 57.9 from 57.3 in July. The measure of new orders climbed to 56.3 from 55.5. An export-order index was unchanged at 52.1. An employment index gained to 51.4 from 50.8. But be careful, China's economy is now hanging on a thread - supported by export orders, internal demand is about to take a big hit as bank lending plunges - new loans slumped to 355.9 billion yuan ($52 billion) in July, less than a quarter of June’s level, and may slump to 200 billion yuan in August, according to the Beijing-based business magazine Caijing yesterday. South Africa’s purchasing managers’ index rose for the third time in four months in August, indicating that the pace of decline in manufacturing may be easing, according to the monthly reports from Kagiso Securities. The seasonally adjusted index increased to 39.3 last month from 37.3 in July. The index has been below 50 since May 2008. However the rate of contraction in SA manufacturing is still very strong. Brazil's manufacturing industry took another step on the road to recovery in August. The seasonally adjusted HSBC Purchasing Managers’ Index returned to positive territory - even if only marginally so - for the first time in almost a year, signalling an improvement in the health of the industry. 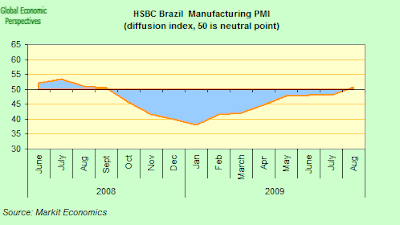 At 50.6, the Brazilian PMI indicated only a marginal strengthening oin operating conditions, on the other hand the index did go back above the critical 50 mark. Underpinning the rise in the headline index were upward trends in four of the five component indices. Incoming new business to Brazil’s manufacturing industry expanded in August for the first time in a year. Although the rate of increase was only modest, it was the fastest since July 2008. Data showed that growth of new work was centred on the domestic market, as new export orders continued to fall. Gains in total new orders were largely underpinned by improved economic conditions. Investments in new equipment (which led to better quality goods being produced), and the launch of new products were also commented on by panellists. Employment across Brazil’s manufacturing sector was broadly unchanged in August. Cost savings and productivity gains were the primary reasons for job shedding where it was reported. The main factor cited by firms noting an increase in staffing numbers was greater production requirements. The U.S. manufacturing sector grew in August for the first time in 19 months, adding to evidence that the recession is ending.